No one enjoys cleaning their oven! One In The Oven’s innovative domestic oven cleaning system allows us to restore your oven, hob, extractor or microwave to ‘as good as new’ condition with no mess involved and a fume free kitchen. One In The Oven uses an environmentally friendly 100% caustic-free top of the range oven cleaning system. 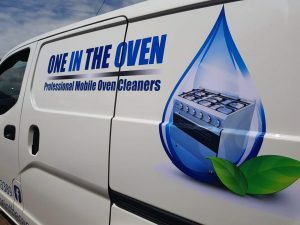 All our vehicles are fitted with a state of the art bio oven cleaning tank enabling us to offer bio degradable, non caustic safe cleaning on a range of kitchen appliances. Our range of 100% caustic-soda free oven cleaning products are specially formulated to provide a safe and clean kitchen, that also enable instant use of your clean oven after we’ve finished – with no fumes and no mess, just a perfect, sparkling result every time. Over the last year we have employed a unique bio degradable, 100% safe cleaning system. Unlike other companies we do not use caustic or dangerous chemicals – we use this system all day every day and value our own health just as importantly as yours! Firstly, our technicians will strip down the appliance by removing all the shelves, interior ‘self-cleaning panels and fan guard (behind which normally lurks an amazing amount of gunge). These parts then go into a custom-made, van-based heated system where grease and other ‘deposits’ are erased. Our technician then returns to the oven where a specifically developed, caustic free formula is applied to the interior of the oven. Using some hard work and specialist cleaning tools all grease and burnt on carbon deposits are completely removed and the interior of the oven is then completely de-greased and polished, along with the bits you can’t normally get to. The remaining parts in the system are then rinsed off and the oven is re-assembled. Lastly, using a de-greasing solution, the exterior of the oven and hob is cleaned, polished and left shining. Now your once filthy but vital appliance is left gleaming inside and out and really does ‘look like new’ and is ready to use immediately. WOW!!! is the best way to describe his work and the feeling I felt when I saw the oven. He did a fantastic job. I can now enjoy my kitchen, a truly clean oven and hob. Worth every £! Thank you so much one in the oven!!! Excellent service. Thank you! Friendly, prompt and efficient. My cooker looks brand new. To say my husband and I were amazed at our oven after Martin had cleaned it would be an understatement! Doors look like new. Well pleased. Another very successful visit, leaving my oven and kitchen spotless. Just had One in the oven in today to clean our double oven and Microwave – it’s fantastic – just like new – and I didn’t have to put my head or hands in it to get that way!!!! Thank you sooo much!! Thank you so much for the fantastic job you did today on our oven – I wouldn’t have believed it could come up so clean! I will be recommending you to everyone I know. The first time one in the oven came to my house, my cooker was in a terrible state. He cleaned it up and I could not believe how it how it gleamed afterwards, in fact it looked brand new! I never thought it could ever look that good again! Since then, he has cleaned my cooker every year (sometimes twice a year) and it saves me a lot of time and mess. Martin is friendly and reliable and I am very happy to recommend him to anyone. If your area is not shown above and you require our services please don’t hesitate to contact us as we will endeavour to accommodate you.